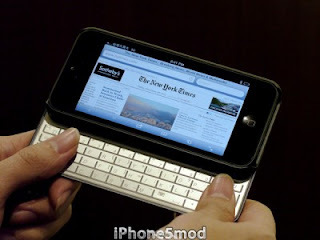 For users of the iPhone must have been accustomed to use for typing, navigation or playing games virtually. But if you want to feel the sensation of typing, navigating and playing games with a physical keyboard, EX Hybrid Controller may be the answer. EX Hybrid Controller allows you to use a keyboard and a physical controller that can be integrated with the iPhone, this is because the EX Hybrid Controller immerse magnet which can be attached firmly to the iPhone. Wrapped with solid aluminum on the front and back, so it is quite light to carry anywhere. With Bluetooth 3.0 you can do typing or playing games with this controller game. Interestingly, this case has a relatively thin thickness of only 2 mm. EX Hybrid Controller made ​​iPhone5Mod claimed as the thinnest and lightest case for the iPhone. Only by doing charging for 1 hour, EX Hybrid Controller can be used for typing or playing games for 40 hours non-stop. Not only that, the standby time can reach up to 160 hours. Devices introduced at CES 2013 is priced at $ 49.90. Well, for those of you who are interested in buying it helps you see the following video. You have finished reading EX Hybrid Controller for iPhone 5 and many articles about Tech Gallery in our blog this, please read it. and url link of this article is https://littlebitjohnny.blogspot.com/2013/01/ex-hybrid-controller-for-iphone-5.html Hopefully discussion articles on provide more knowledge about the world of new tech gadgets.